How long can the worlds' gluttony for debt continue? Seemingly forever, until it cannot. That was the experience of New Zealand in the 1970s and early 1980s when government subsidies ruled the economy until the country went broke. Through the first half of the twentieth century, New Zealand’s close ties to England ensured a steady flow of lamb and milk products from the former colony to “blighty”, at economic terms that benefited both the UK and New Zealand. This ensured that the New Zealand agrarian and rural economy continued to grow, benefiting the entire country. This also allowed for subsidies on imported goods, and on good assembled in New Zealand from imported parts (such as automobiles). That could not and did not last forever. When the UK joined the European Common Market, they were required to abandon their Commonwealth trading relationships and imposed the common European trading relations, which included protectionism for European economies. New Zealand suffered. But so did Australia. After Britain had joined the EEC Australian butter exports dropped by more than 90 percent; the Australian apple trade declined from 86,000 tonnes in 1975 to just 27,000 tonnes in 1990. The economic consequences of Britain's European ambitions for Australia were severe. New Zealand was hit even harder, with pre-EM exports to the UK accounting for up to 55% of all exports (1958 – 1960), with 90% of milk and butter going to the UK, and over 95% of lamb (and 80% of mutton). This export market had grown New Zealand sheep populations into the 60+ million sheep, or 15 sheep for every Kiwi. The short story is that with the loss of the UK markets, the New Zealand government and the National Party (the conservative and party of rural and agricultural New Zealand) attempted to hold up farming and rural incomes through subsidies. Up to 40% of the value of a sheep was in subsidies. The only problem was that the National government (the conservative party) was running deficits like crazy to fund the range of subsidies, and the deficits were doing exactly what should be expected, devaluing the currency and increasing national debt servicing costs. Inflation was high, and a wage and price freeze did nothing to alleviate the problem, and international pressure was undermining the value of the currency. And they continued to build that debt, and pay the subsidies, until one day the money ran out, or more realistically, until National and the Prime Minister were told by Treasury that the money was going to run out. The crisis had arrived. So, having kicked the can down the road as long as they could, heaping subsidy on subsidy, hoping that it would all fall apart under the “next” guy’s administration, they ran out of money. It was their problem. Well, Robert Muldoon did what any responsible politician and Prime Minister should do – he got drunk and while drunk, called a snap election, knowing full well that National would lose, and the problem would be Labour’s. Not surprisingly, National lost, and Labour won. 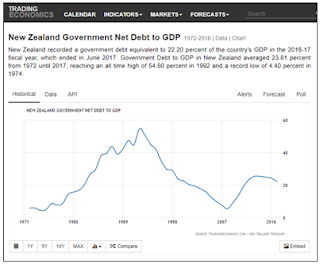 A multi-year devaluation of the currency, ballooning sovereign debt payments, rising unemployment, and a disconnection from urban New Zealand meant it was time for a change. The can had been kicked as far and as long as possible. So began years of economic restructuring in New Zealand, with years of associated pain up and down society. With no subsidies, large numbers of farms became financially unsustainable, with bankruptcies and forced sales. There were stories of farmers committing suicide as the auctioneers arrived at the properties. Automobile assembly plants closed with the loss of jobs. Imports rocketed in price, and taxes increased to nose-bleed levels. I remember 66% income tax over a (fairly low) level. Labour had the courage to throw away their platform and enact wide-ranging economic reforms. The pain was incredible. 75,000 manufacturing jobs and over 20,000 jobs in the public sector were lost in the five years from 1987 - 1992. With the pain of liberalising the economy, employment began to grow again through the 1990s, and New Zealand became one of the most open economies in the OECD (from a position of being the least open of 24 OECD economies in 1984). The sale of State Owned Enterprises resulted in both massive pain, exportation of profits from the privatised industries (such as Telecom NZ), but also the modernisation of industries that remained in government hands as businesses (such as NZ Post), most of which became profitable businesses returning an ongoing dividend stream to the Crown (NZ Government). Unlike New Zealand, when Zimbabwe hit the wall of national debt, they kept printing money and borrowing, resulting in devaluation and inflation, and ultimately a ruined economy (with a little help from property confiscations and destruction of businesses). Looking at the chart above, national debt exploded to almost 140% of GDP, dropped, then peaked again at 147% of GDP before dropping again. Why did it drop? 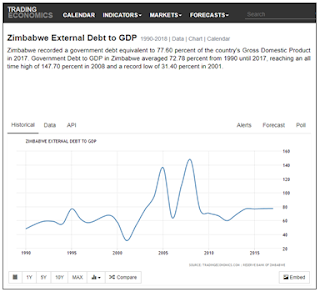 Without even minimum fiscal discipline, international lenders simply would not buy Zimbabwean national debt at any price, and maturing debt had to be repaid – with printed money. The cycle repeated, and debt to GDP has stabilised around 80%. What stopped the international community? When “the inflation rate reached a peak of 89.7 sextillion (10^21) percent” in 2008. 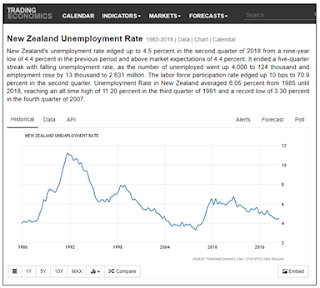 New Zealand, by contrast, managed to keep inflation, while high for a period, relatively under control, and the economic reforms and fiscal discipline provided the comfort required to manage international expectations of the value of the currency. Inflation peaked before Muldoon was forced out (by his own policies) and was brought under control by the Lange government. The national debt was also brought under control and paid down, and while spending and borrowing have increased, debt to GSP ratio remains well under 30%; healthy by international standards, and simply low by OECD and “First World” standards. Will the “West” chose the New Zealand route of hard choices and “short term” (3 – 5 years) pain, or the Zimbabwean choice of continued printing of money, devaluation, and hyperinflation? 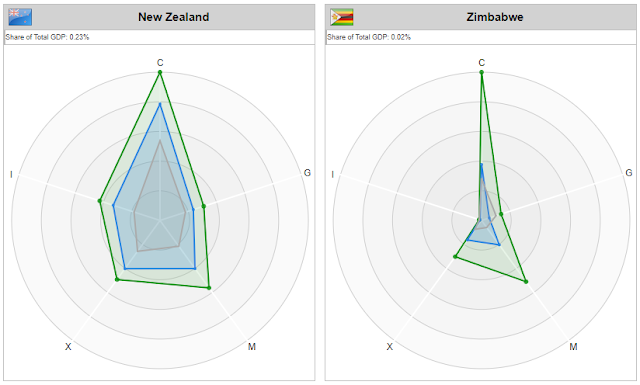 The following graphic shows the results of the choice made by New Zealand, and the choice made by Zimbabwe. The grey is 1994, blue is 2004, and green is 2014. Zimbabwe’s choice effectively destroyed their economy and they have lost more than a decade. New Zealand’s choice has, after a difficult period in the 1980s and early 1990s, resulted in a consistent and solid growth. What New Zealand in the 1970s and early 1980s also shows us is that politicians will continue with their profligacy until they cannot. They will keep kicking the can down the road until they cannot. They will keep hoping that their policies can continue until the “next guy” has to deal with it. We know this because it already happened, in New Zealand and then, to a lesser extent, in 2008, resulting in TARP and bailouts of industries that lasted for years in the US and across Europe. Unfortunately, the ammunition to replicate that kind of stimulus probably no longer exists, and as with Zimbabwe, the first period of money printing did not teach politicians that this was a major danger, but seems to have taught them that they can do it again, and again. Now the Fed (in the US) and the ECB (in Europe) face the problem of QT - Quantitative Tightening, a process as fraught with risk as the original QE. Growing economies do not like restrictions on the money supply. So what choices will the politicians make next time? Whatever the answer, I suspect we will see the results before long.